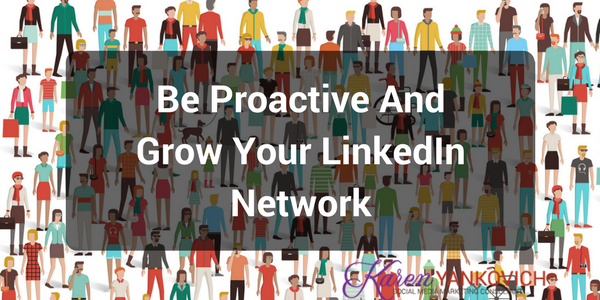 Are You Proactively Growing Your LinkedIn Network? Are you reactive or proactive when growing your LinkedIn network? When I first started to realize the power of LinkedIn, I was very reactive to growing my network. When people asked how I decided who I chose to connect to I quite boastfully said “Oh I don’t connect with people, they connect with me”. Good grief. My network grew, and my business grew. Despite my utter lack of planning in growing my tribe. Thankfully, I saw the error in my ways pretty quickly. Sure, it’s great when people you don’t know are interested in the work you do, and I’m always interested in growing those connections. But that’s a reactive way to grow your business, and you don’t have any control over how to turn those connections into leads and customers. I like to have control, and be able to project success based on my marketing efforts. Now I have a proactive strategy for growing my network. On ALL social platforms. Today, we’re talking about LinkedIn. Now I have a proactive strategy for growing my network. On ALL social platforms. Here’s what I do now. I take a look at my goals for my business. I take a look at my ideal client profile. I have more than one! So I compare my six month business goals with my ideal client profiles, and I decide who I want a network full of. For example. Let’s say you’re a business coach. And you help finance executives grow their business. And you’ve got a local workshop coming out in July that you want to fill FULL of finance executives. You’re going to want to do a LinkedIn search that narrows down your audience. Use geographic parameters, use keywords. Once you’ve got your search where you want it, start connecting! Let’s say you’re a genius with sales copy. I know a ton of entrepreneur friends who would want to get to know you! So you’d use search parameters that don’t include geographic, more demographic and keywords like “online” “digital” and “entrepreneur”. And you’d start connecting. I can hear your thoughts. Now you’re thinking “Just connect? With people I don’t know? Isn’t that spammy and against LinkedIn’s terms of service?” YES. Just connect. But find a way to do it in an authentic way. So our finance business coach. She’s looking to grow her network geographically. She can go through that search, and customize the connection request saying “Hey name! I just came across your profile here on LinkedIn and I love being connected to other local business owners. Hoping to connect with you here”. This way you’re giving them a reason for the connection, they don’t have to know that the reason is because they met your search parameters! See how easy this is? Imagine, 6 months from now, you’ll have a LinkedIn network chock full of your ideal clients! How amazing would that be? Don’t connect the day before you have something to invite them to. Think ahead! What are you promoting in 6 months that you’d love to have 100 ideal prospects to invite? Be sure to customize your connection invite! You don’t want people to report you for spamming them. Be consistent. Connect with 10 people every day, not 100 every Monday. You want LinkedIn to see that this is normal business for you, and not send up red flags. Be sure your profile represents you as someone they would WANT to be connected to! If you’re not sure where to start with that, here’s a free video series to help you out. That’s it! Easy to do. Next week, we’ll talk about how to ATTRACT more connection requests from your ideal clients. Stay tuned. In the meantime, come on over to my LinkedIn group and let me know how this connecting is going. I’m there to support you in this! Karen – as always you give us simple techniques to build. The reminder that LinkedIn will see you as a business person with only 10 requests a day is helpful.